According to constitutional law expert Jonathan Turley, the prosecution of Bush’s so-called “torture lawyers” might just give Spanish prosecutors the “low lying fruit” needed to bring a case against Vice President Cheney. Appearing on Monday night’s edition of MSNBC’s Countdown with Keith Olbermann, George Washington University law professor Turley said that although President Obama is “protecting” the former administration from prosecution, the Spanish investigation could serve as a point of leverage. “And then if you have a case, you go for the higher ones,” he added. This video is from MSNBC’s Countdown, broadcast Mar. 30, 2009. The media in those days was AM radio and the news papers, but there was considerable propaganda at the movie theatres. The News and a cartoon were always shown before the previews and the main feature. In those times the focus was on “guns and butter”, and the idea presented was for the tax payers to conserve resources and pay for the war by raising taxes. We have come a long way since then, and the industrial war complex has morphed into a corpo-government that advocates using up resources and cutting taxes. Propaganda these days is a 24/7 thing where the truth is buried in dis-information by media that is bought and paid for by the same crooks that we are trusting with our tax money. Financial-market wise guys, who had been seized with fear, are suddenly drunk with hope. They are rallying explosively because they think they have successfully stampeded Washington into accepting the Wall Street Journal solution to the crisis: dump it all on the taxpayers. That is the meaning of the massive bailout Treasury Secretary Henry Paulson has shopped around Congress. It would relieve the major banks and investment firms of their mountainous rotten assets and make the public swallow their losses–many hundreds of billions, maybe much more. What’s not to like if you are a financial titan threatened with extinction? If Wall Street gets away with this, it will represent an historic swindle of the American public–all sugar for the villains, lasting pain and damage for the victims. My advice to Washington politicians: Stop, take a deep breath and examine what you are being told to do by so-called “responsible opinion.” If this deal succeeds, I predict it will become a transforming event in American politics–exposing the deep deformities in our democracy and launching a tidal wave of righteous anger and popular rebellion. As I have been saying for several months, this crisis has the potential to bring down one or both political parties, take your choice. After a former Bush official responded to a lawyer who’s suing him for alleged torture at Guantanamo Bay, the lawyer has fired back in kind. Douglas Feith, former undersecretary of defense under President George W. Bush, is accused by Spanish human rights lawyers of providing legal cover to Bush policies under which detainees were tortured. The lawyers want to try a number of Bush officials — among them former Bush Attorney General Alberto Gonzales — in Spanish court. “They criticize me for promoting a controversial position that I never advocated,” Feith added. 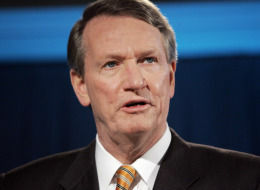 The Obama administration asked GM CEO Rick Wagoner to step down, according to numerous reports. Mr. Wagoner was asked to step down on Friday by Steven Rattner, the investment banker picked last month by the administration to lead the Treasury Department’s auto-industry task force. Mr. Rattner broke the news to Mr. Wagoner in person at his office at Treasury, according to an administration official. Afterward, Mr. Rattner met one-on-one with Mr. Henderson, who will fill in as GM’s CEO. General Motors CEO Rick Wagoner will step down from the company, according to several reports. Six Bush-era officials responsible for crafting the legal justifications permitting the military prison at Guantanamo Bay are the subject of a potential Spanish criminal probe which could place the men under serious risk of arrest if they travel outside the United States. “[Spanish newspaper] Público identifies the targets as University of California law professor John Yoo, former Department of Defense general counsel William J. Haynes II (now a lawyer working for Chevron), former vice presidential chief-of-staff David Addington, former attorney general and White House counsel Alberto Gonzales, former Assistant Attorney General Jay Bybee, now a judge of the United States Court of Appeals for the Ninth Circuit, and former Undersecretary of Defense Doug Feith,” noted Scott Horton at Harper’s. On March 17, Lawrence B. Wilkerson, former chief of staff to Secretary of State Colin Powell, published an editorial in the Washington Note which accused Bush officials of knowingly holding innocent men in Guantanamo Bay for years. Gingrich and Hannity think America is hurtling towards socialism, or worse, dictatorship. Funny that Gingrich and Hannity sure didn’t care when their Republican buddies in the White House and Congress spent the last eight years trashing the US Constitution and the rights of our citizens, all for the “greater good.” That was okay. But trying to pass legislation to make it easier to forestall a depression, that’s dictatorship. So, in a nutshell: Taking rights away from citizens is patriotic, but taking rights away from corporations is dictatorship.